Medicinal mushrooms are specific strains of wild edible mushroom species that are used for their unique and extraordinary health enhancing compounds. They are a class of superfoods created from the actual fruiting body as well as the mycelium biomass and spores or seeds of the mushroom. Many of these varieties have existed on earth for millions of years and have been utilized by humans since the beginning of ancient folk medicine. 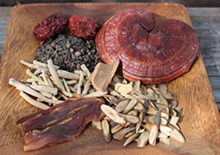 Some of the popular ones, such as reishi and cordyceps, are famous as top major tonic herbs and have thus been prepared in traditional Chinese tea formulations for centuries. Chaga, maitake and turkey tail mushrooms are frequently highlighted in news headlines for their profound antitumor properties. While others, like lions mane, agarikon and agaricus blazei, are less known but recently becoming more common among a more mainstream audience. Current scientific research, as well as the historical and cultural use of mushrooms around the world, has shown that these medicinal fungi have a very positive relationship with, and influence on, the human body when consumed. Mycelium is the fine, white, thread-like fabric, a network of cells that decomposes plant and animal matter. The mushroom is the fruiting body of this complex matrix. Mycelium is essentially the very construct of the food chain that evolved over 1.7 billion years ago, preparing the way for the evolution of all plant species in existence. In the words of mycologist Paul Stamets, "The entire food web of nature is based on these fungal filaments, the mycelium network that infuses all land masses in the world is a supportive membrane upon which life proliferates and further diversifies." This mycelium "fabric" is often described as the Earth's living "internet", sharing complex biological information and nutrient flow. High quality mushroom extracts often include this mycelium biomass, in addition to the fruiting body and sometimes spores of the mushroom species. 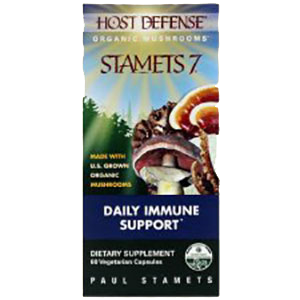 Immune Modulating "Host Defense Potentiators"
These types of mushrooms are potent superfoods for the immune system. 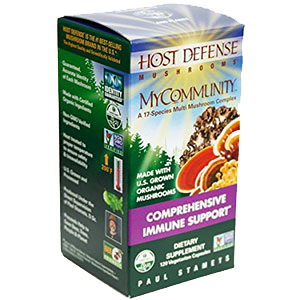 Containing polysaccharides, like highly structured beta-glucans, as well as various other myco-nutrients and antioxidants, including triterpenoids, glycoproteins, flavonoids and ergosterols, they are extremely beneficial for building a natural resistant to disease, viruses and environmental toxins. 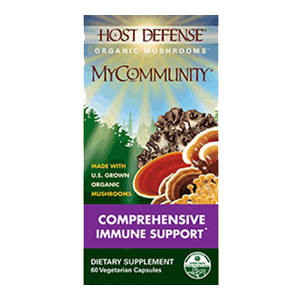 The term "host defense potentiators" (HDPs) is often used to describe the immune-modulating effects that mushroom compounds can have on infection and disease. This is a claimed ability to enhance one's (the host's) defense mechanisms rather than killing any one pathogen directly. Each specific medicinal mushroom species has its own distinct combination of polysaccharides which boost the activity of immune system in different ways. 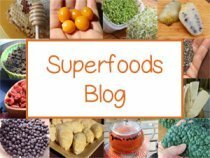 They are all considered "immunomodulators", containing powerful adaptogenic substances that help the body "adapt" to stress factors brought on by external environmental influences or internal imbalance. Specifically, they can significantly increase the body's resistance to trauma, anxiety and fatigue as well as encourage protective effects against environmental pollutants and toxins. Mammals actually share a deep evolutionary history with the fungi kingdom and likewise share similar risks of infection from a number of the same microorganisms. 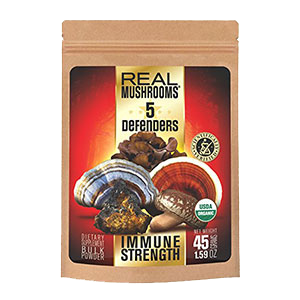 Out of the need to protect against bacterial invasion, medicinal mushrooms have developed a strong antibiotic immune defense system, which also happens to be effective for building immune response in humans. 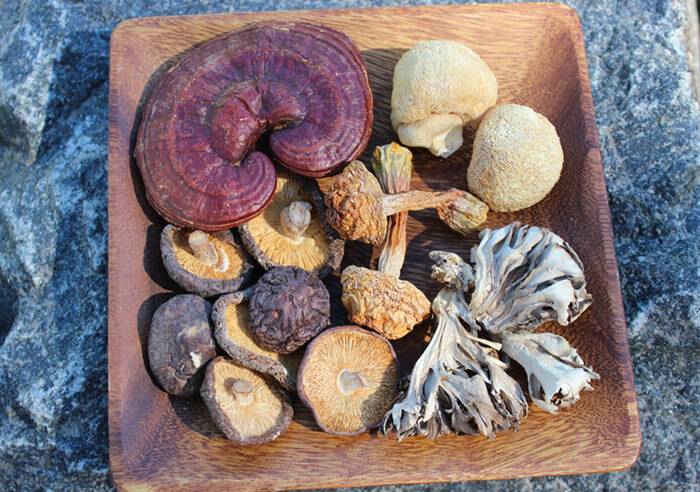 In fact, some of the very first Western medical antibiotics were extracted from these mushroom varieties. Some of the common ones many people use today, like penicillin and tetracycline, are derivatives of these fungal metabolites. When you think about it, this particular family of edible and extracted mycelii provide us with the same immune building properties that also protect and weave together the soil and earth itself! In the book Mycelium Running: How Mushrooms Can Help Save the World, it states that: "We are now entering a time when mycofilters of select mushroom species can be constructed to destroy toxic waste and prevent disease, such as infection from coliform or staph bacteria and protozoa and plagues caused by disease-carrying organisms." 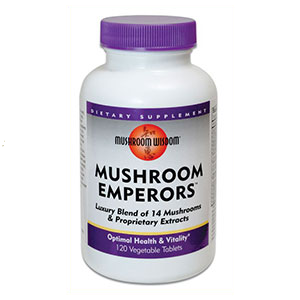 Many top health authorities today are likewise beginning to understand the health enhancing potential that medicinal mushrooms can offer to a wide range of people seeking improved immunity in the ever-changing world around us. Here is our top list of medicinal mushrooms, each containing their own unique constituents that may be more or less appropriate depending on your individual needs and specific health goals. 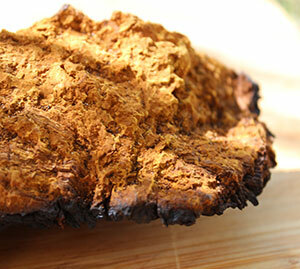 Chaga mushroom, also called "cinder conk", often grows on birch trees found in colder climates throughout the world and has been long used by Russian herbalists as a remedy for restoring vitality and maintaining health. 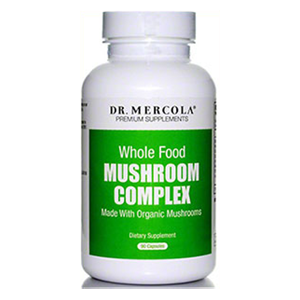 In addition to sterols, polyphenols and polysaccharides, the mushroom also contains a host of other antioxidant constituents including melanin, superoxide dismutase and triterpenes, like betulin, inotodiol and lupeol. It is also gaining recognition around the world for its ability to help inhibit tumor growth via certain anti-mutagenic compounds like betulinic acid which it concentrates in high amounts from birch bark. 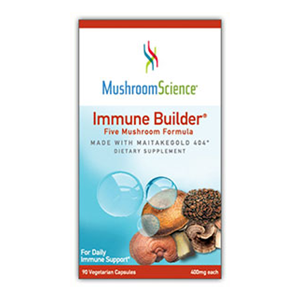 Inonotus obliquus is on our top superfoods list as a #1 mushroom for autoimmune disorders. Agaricus blazei is a Brazilian mushroom species also called "cogumelo do sol" (mushroom of the sun) and also goes by the name Agaricus brasiliensis. 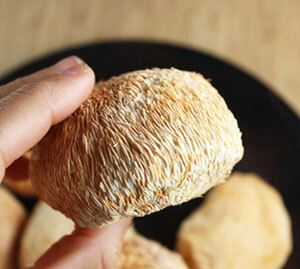 It is another type of mushroom that can be eaten fresh and is described to have a sweet almond-like taste. However, like all medicinal mushrooms, it needs to be heated or prepared in hot water or an alcohol solution to release beneficial healing components. 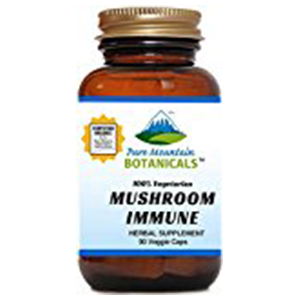 Agaricus has a high concentration of beta-glucans which help to modulate immune functions. 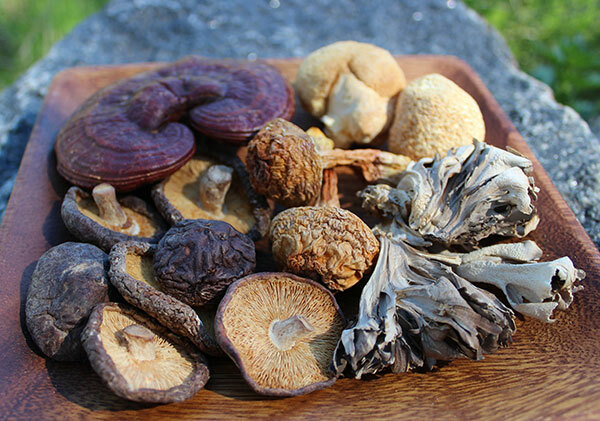 Agaricus is up on the list with other chemoprotective mushrooms like coriolus and reishi, commonly used in Japan and China as adjunctive agents in chemotherapy treatment. It is related to the white button Agaricus bisporus variety, also known as cremini or portobella mushroom. This cultivar, however, is largely void of medicinal properties according to research. 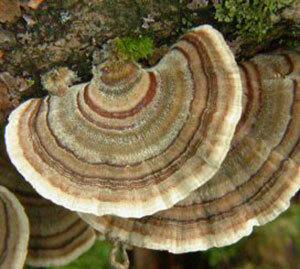 Coriolus is a very popular mushroom species that grows all over the world in a number of climate zones. 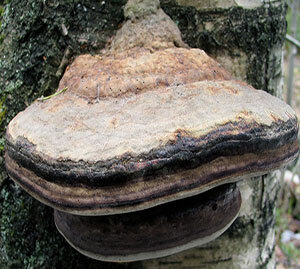 It is easily identified, usually forming great shelf-like colonies on decaying logs and trees. Referred to as "turkey tail" for it's shape, lines and colors that resemble wild turkey tail feathers, it is one of the most studied of the medicinal mushrooms varieties. Cordyceps sinensis helps to strengthen weak immune systems and adrenal depletion caused by physical, dietary and environmental stress factors. 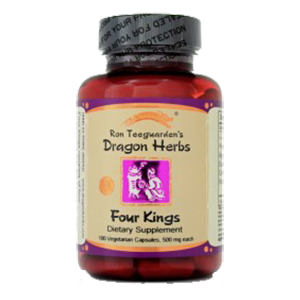 It repairs, nurtures and supports the adrenal system and works with the endocrine system to balance hormone levels. 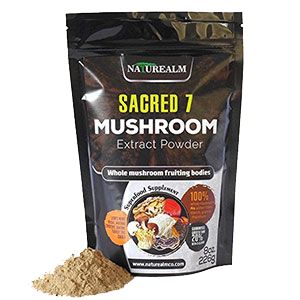 The mushroom is known in TCM to be particularly nourishing to the lungs, kidneys and is famed as a powerful aphrodisiac, rejuvenating the body and sexual organs in both men and women. 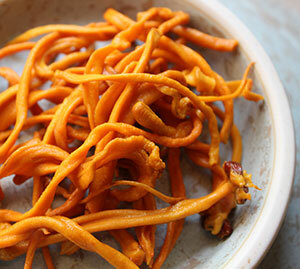 Cordyceps contains beta-glucans and the antitumor inhibiting CO-1, plus the compound called "cordycepin", which is unique to this mushroom variety. Maitake, also called "hen of the woods", is a perennial fungus that often grows in the same place every year, usually at the base of oak trees. One of its main polysaccharides is a unique protein-bound beta-glucan referred to as D-Fraction. 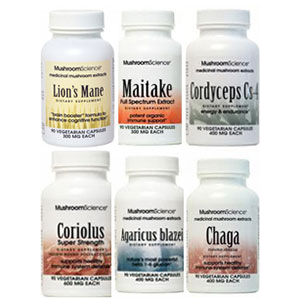 This myco-nutrient is one of the main substances responsible for maitake's powerful immune modulating activity, recognized as a potential anti-cancer agent. In one study published in the Journal of Medicinal Food it states that "Maitake D-Fraction appears to repress cancer progression and primarily exerts its effect through stimulation of NK cell activity." 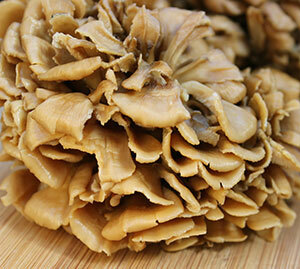 The mushroom can be used for improving spleen and stomach ailments, calming anxiety and treating hemorrhoids. It is commonly eaten fresh, like shiitake, in Asian countries and also used by chefs worldwide as a "gourmet mushroom" in soups and sauces. 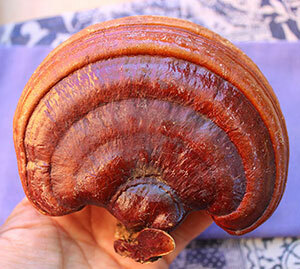 Reishi, has been documented in the earliest pharmacopoeia texts in Asian culture dating back thousands of years ago. It is considered a potent "Shen" tonic because of its ability to calm the nerves and kidney system. It is known in Traditional Chinese Medicine to "open the spirit" and has been used by Taoists for achieving "spiritual immortality" or enlightenment. Ganoderma lucidum is also known to help with nerve rejuvenation and insomnia, helping one to sleep well yet sustain high levels of energy throughout the day. 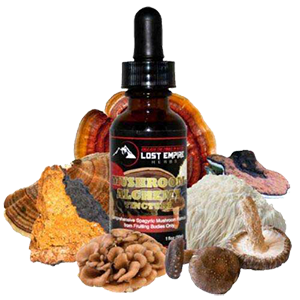 Reishi is now becoming recognized as an alternative pharmacological supplement in the treatment of diabetes, cancer, leukemia and hepatitis. The mycelium contains many different constituents including triterpenoids, polysaccharides, peptides, nucleotides, sterols, steroids and various trace elements. These compounds have shown therapeutic results as immunomodulators, anti-inflammatories and antitumor agents. 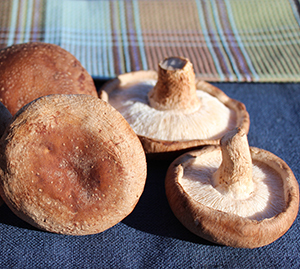 Shiitake is one of the most popular edible "gourmet" mushrooms because of it's rich flavor and soft meaty texture. 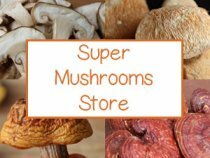 Many people do not realize that shiitake is also incredibly medicinal in nature providing a host of compounds, like AHCC, eritadenine and lentinan. These active ingredients have been proven beneficial for boosting immunity, lowering cholesterol and inhibiting certain types of cancer like gastric or stomach cancer. Agarikon, although once widespread, is now a rare and endangered species found almost exclusively in the old growth forests of the Pacific Northwest region of the U.S. and Canada. Wild spore strains of the mushroom are being genetically preserved to a large degree through the efforts of mycologist Paul Stamets and his company Host Defense. Agarikon contains a full spectrum of myco-nutrients coming directly from one of the most beautiful and pristine habitats on planet earth. 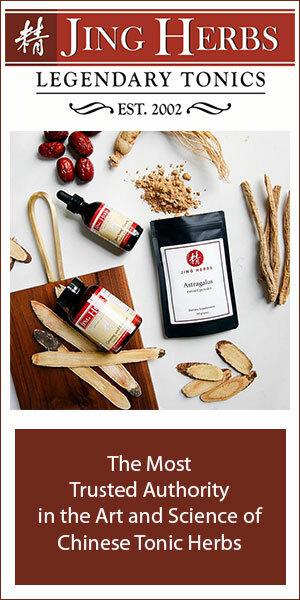 Agarikon contains constituents such as beta-glucans, glycoproteins, ergosterols and triterpenoids. 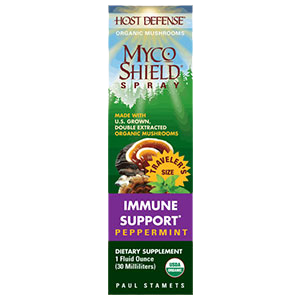 The mushroom has been researched extensively by the Bioshield Biodefense Program administered by the U.S. Dept of Defense for its impressive array of anti-viral compounds that may be potentially effective against lethal viruses like the poxvirus. Medicinal mushroom fruiting bodies need to be heated to release their beneficial properties. The cell walls in these mushrooms are actually made up of a substance called "chitin", an extremely hard cellulose-like structure similar to lobster shell. The polysaccharides are trapped within this shell wall which needs to be broken through high temperatures. 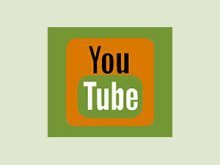 The three most common ways to do this are as a tea decoction, a hot water extraction or a hot ethanol extraction. 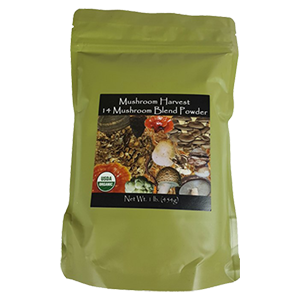 For the most potent intake of mushroom medicine, it is best to consume mushroom "extracts", which are powdered mushrooms that have gone through a hot water extraction process. These extracts are highly concentrated substances using state of the art biotechnology and the most proven effective for therapeutic use. 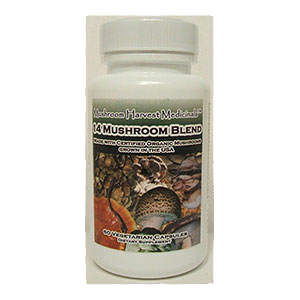 They simply make the myco-nutrients within the cell walls of the medicinal mushrooms more "bioavailable" and readily absorbed in the digestive tract. Powdered extracts (using hot water) or liquid extracts (using organic ethanol), are usually produced from the actual mushroom body, while the white mycelium biomass and spores are usually added or used exclusively as the main supplement ingredient. It is becoming increasingly popular these days to find hot water extracts that also include the spores as well as the mycelium biomass. 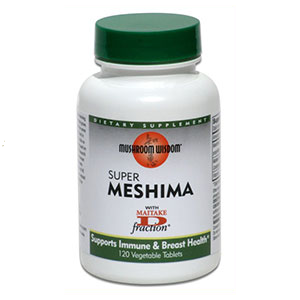 The following brands are some of the highest quality mushroom supplements on the market. Sometimes the powdered extracts come in the form of a bulk powder and sometimes they are encapsulated. For convenience you can take the mushrooms in capsule form or open them up and use them as a straight powder in tonic teas, blended drinks, desserts or even raw chocolates. Tea decoctions are made by simmering the raw dried mushroom powder, slices or pieces in water for at least 20 minutes, preferably one hour or longer. The strained liquid can be consumed as a straight tea or used as a base for shakes, soup broths or when making nut milks. You can also eat some of the mushrooms after this process, depending on the variety, but the tea is where the nutrients are concentrated. Many of these mushrooms can be purchased in bulk quantities by the pound in the form of a powder, whole mushroom, slices or pieces. 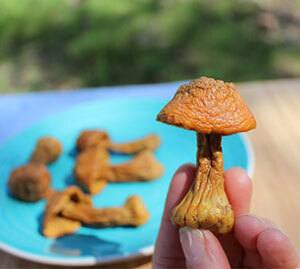 Making medicinal mushroom teas is another way to break down the chitin and release the polysaccharide-rich medicine. But teas, remember, are sometimes a little less potent than extracts unless you are using a lot of mushroom mass per quantity of water and slow brewing it in a crock pot for many hours. In preparing teas, you also have the option to add in Chinese tonic herbs as well as Ayurvedic herbs to your tea formulas. This can increase the potency and effects of the ingredients used and is the traditional way they have been brewed for thousands of years.